"You're The Only World I Know" / "Roll On Buddy" (RDC 6691). Was able to date the band as late as 1970, with two references to this group in the Greeley newspaper, (headliners for a local dance). Discovered that a musician named Roy Cary was born in 1928, and passed away in 1979, in Denver. Found a reference to another Roy Cary, also from Denver (born in 1919), who was paralyzed due to polio. That Roy Cary played the accordion. 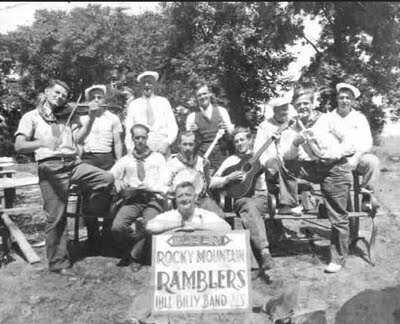 Found this random picture of the Rocky Mountain Ramblers, but nothing else associated with it. Quite possible that it's an Ohio/Pennsylvania/Indiana-based group of the same name. No date. 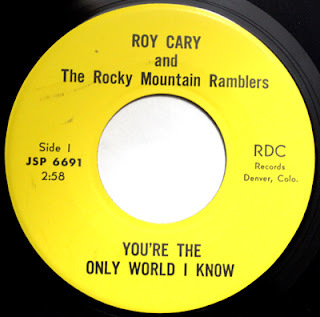 I did see a reference of another single by Roy Cary and the Rocky Mountain Ramblers, "Standing at the End of My World" / "Lazy Day," (JSP 6672). 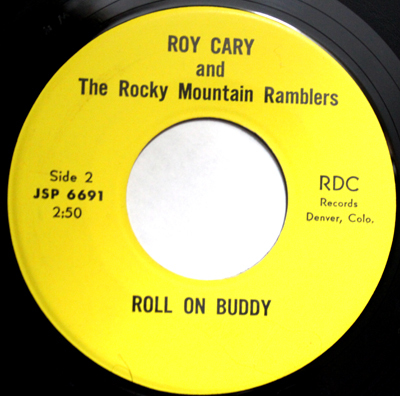 In spite of the mysteries, Roy and the Rocky Mountain Ramblers live on in the 1994 rockabilly CD comp Honkin' Billy, where you will find "Roll on Buddy" included.